Sheetstweets is completely free and I will help you set it up. Click the button and follow the instructions. It can post on Twitter automatically based on Medium recommends. Sheetstweets is a tool for automating Twitter posting. It is made entirely with Google Spreadsheet and IFTTT. Which means it is 100% customizable. Initially it is build with Medium articles in mind, but that is just the beginning! Sheetstweets is a chain of events happening in Google Spreadsheet. The chain is started by IFTTT when it adds a new row in one of the sheets. The spreadsheet then takes the new value and take some steps based on that e.g. scrape a website or make a list of tags into a Twitter-ready text of hashtags. The infographic below explains the process superficially. The setup I have made here is based on sharing a tweet about an article you have read on Medium. The reason for this is that it showcases perfectly how you can use Google Spreadsheets scraping functionality to get the right tags and the author’s twitter handle automatically. With that said this framework can be customized into any kind of awesome setup you want. Sheetstweets is completely free and I will even help you set it up. 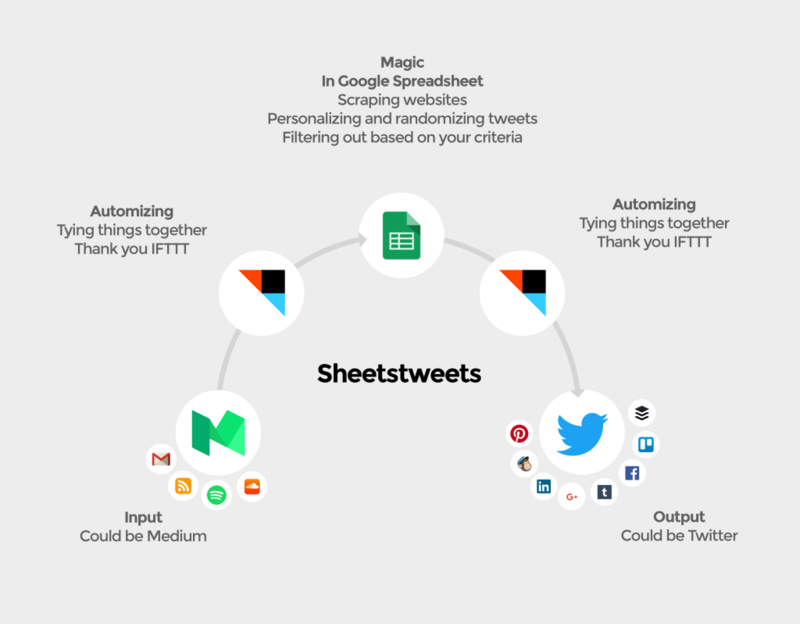 Sheetstweets is a Twitter automation hack made in Google Spreadsheets, which enables you to automatically Tweet about articles from Medium and it is the foundation for any other setup you might want to automate. After you are done watching the 4 videos you will have your own working setup for your Twitter account. You don’t need to be a computer wiz. I explain how to do everything in the videos. I will explain what you need in the videos, but if you are curious I can tell you that you need a free account here: Twitter, Medium, IFTTT, Google (Gmail, android, google.drive etc.). The cool thing about Sheetstweets is that you don’t need a server to use it and it is completely free. Be the first to know about new things I make! There are many different types of Twitter bots. The common theme among them is that they can act on behalf of the owner. Some of the most common uses are to auto reply or auto-tweet based on some preset template. Sheetstweets on not a bot in the same way as described here. Sheetstweets only auto tweets when you recommended a Medium article. Opposite many of other twitter bots, this doesn’t have any follow automation. How to make a twitter bot without coding? To set up the bot for yourself all you need to do is the follow the guide provided. Just click the button above. You don’t need any software on your own computer, the bot runs entirely online from Google Sheets with the help of IFTTT. What is the best tweet scheduler? The best tweet scheduler, in my opinion, is Buffer. Luckily you can easily connect Sheetstweets to Buffer. That way it will tweet using Buffer instead of directly auto-tweeting to Twitter. If you do decide to connect it with Buffer, you would be able to check your future tweets by visiting your Buffer que. Can I get tweets with images? Yes. If the Medium post has an image connected it will automatically appear in the auto tweet. Alternatively, you can make upload an image to twitter and embed the URL in your tweet templates. That way you will images in your tweets.